E-Catalog > CEM Microwave > ???????????????????????????????? The Discover® SP System is the newest member of the Discover product line and the premier microwave synthesis system on the market. The Synergy™ software and onboard controls of the Discover SP make it the easiest-to-use microwave system, even for those who have little or no experience with microwave technology in the laboratory, while still maintaining all of the advanced programming options requested by skilled microwave users. This new system has all of the features for which the Discover series is known, an enhanced heating capability, and CEM’s new ActiVent® Technology, all in one compact, simple-to-operate system. 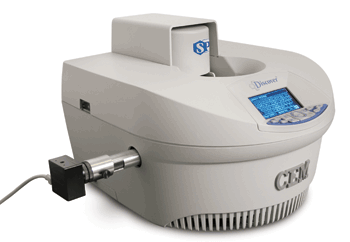 As the most advanced technology designed for microwave synthesis, the Discover SP provides superior flexibility with easily interchangeable accessories that enable you to do your chemistry, your way! Patented Focused single mode cavity. This third generation cavity is the newest single mode design on the market. Self-tuning cavity - No more guessing about the correct position of the reaction vessel for optimum results. Discover is automatically tuned to ensure reproducible reaction conditions and results every time. Continuous power generation and control of power supply - capable of supplying power in 1W increments from 0 to 300W. Vertically focused IR temperature sensor (patented) - no need for different vessels to get an accurate reading, regardless of volume. Hot Keys - Another CEM first that makes the Discover the easiest-to-use microwave synthesizer on the market. The 80-mL vessel allows a working volume up to 50 mL and operation at elevated temperatures and pressures (250 °C and 250 psi (17 bar)). Fiber Optic temperature control provides the most precise temperature available by directly measuring the temperature inside the reaction vial. It can be used with 10-mL reaction vessels designed for this purpose, as well as with the 80-mL vessel. Other accessories, including the CoolMate and Gas Addition Kit, use this type of temperature measurement. The optional integrated camera allows you to see the changes occurring during your reaction. It's the perfect tool for documentation and publication support. The Gas Addition accessory is the only system specially designed for reactions involving gaseous reagents. Perform hydrogenations, carbonylations, or other reactions with non-corrosive gaseous reagents by pulling a vacuum or purging the reaction vessel and back-filling with a gas. During the reaction, the gas source is completely shut off from the microwave, thereby ensuring your safety at all times. 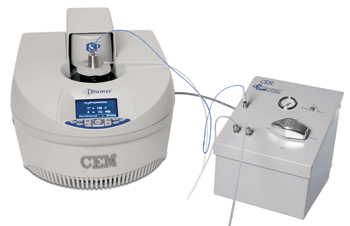 CEM offers a range of flow cells for the Discover SP and Discover legacy systems. 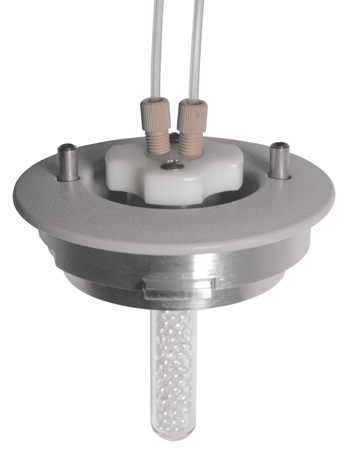 One of the main flow cells we offer is a 10-mL continuous flow cell. 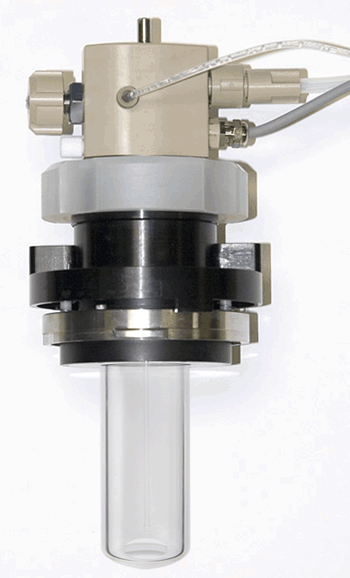 This flow cell is provided with inlet and outlet tubes as well as a back pressure regulator. It also comes with its own microwave attenuator (or micrwoave door) that allows it to snap in and out of the microwave cavity interchangeably with your other microwave vessels. For more information on our flow cells please call or email us. 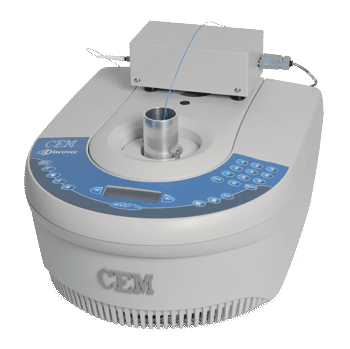 Enzymatic digestions and proteomic sample preparation can now be performed in minutes. The Discover Proteomics System provides accurate, reliable results for membrane solubilizations, ICAT & iTRAQ™ tagging, and in-gel and solution digests. Other Product In Group "CEM Microwave (16)"